I used to wait table in high school and college. So did my kids. Once my daughter (who worked at Applebees) waited on a table of eight who left her a $2.00 tip. She had to tip share with the bus crew based on the amount of the bill. That night she worked for free because Applebees had no policy of adding the tip for large parties. She came home in tears. I will NEVER eat at Applebees because of that. Fr. John Hardon used to recommend that one way of doing charity was to leave generous tips for those who worked for small wages. So we are generous tippers and pretty slow to get upset. These days working with the public is tough. Our culture is increasingly more rude and more crude. Just look at the comments on social media. Hey, you can name call and sling profanities from behind the "anonymous" rock. I think a good new year's resolution would be to treat everyone, including the most casual contacts during your day, with a friendly comment and a cheery smile. ....give him some swaddling clothes. 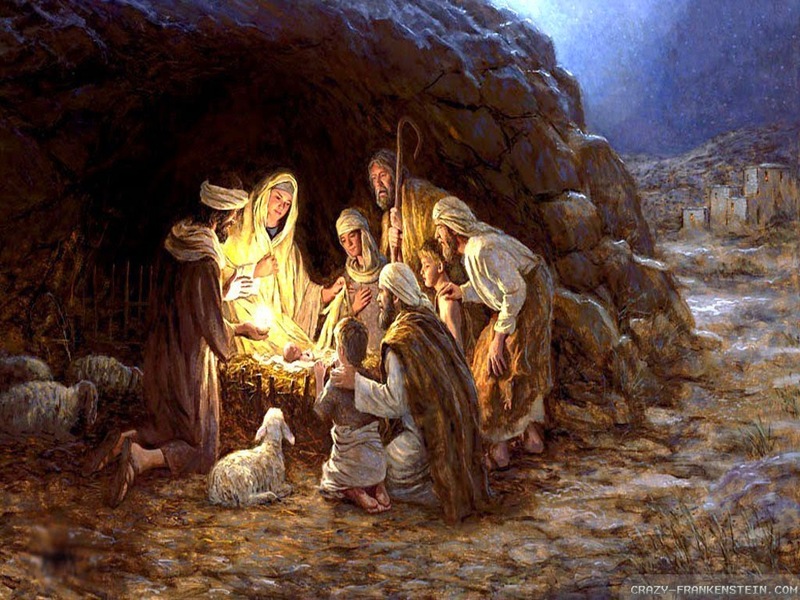 Did you ever notice in manger scenes that everyone has lots of clothes on except the poor baby. Mary wears a long gown with a mantle and veil. Joseph has on a long tunic and sometimes even a turban. 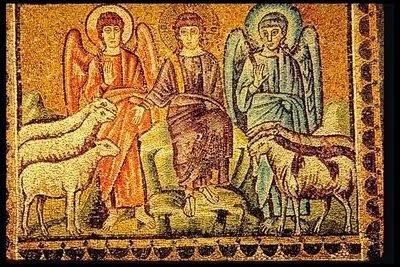 The shepherds often are covered with nice warm fleeces in addition to their other clothing. The only one exposed to the cold is poor Baby Jesus. Now don't you think the first thing Mary would have done after the baby's birth was to wrap him up in those swaddling clothes the gospel talks about? Matt Barber has it right. In the face of Satan's persecution against those who defend natural marriage and will not cooperate with evil, refuse to submit and stand your ground! Too many Christians are leaving the battlefield in full retreat instead of standing against the enemy. Like David facing Goliath, it's time to look for the five smooth stones that will ultimately destroy the behemoth. "Resist the devil and he will flee from you." (James 4:7) No Christian should be forced to choose between his job and his faith. Time Out for Gramma Fun! After Christmas dinner yesterday we brought two of our young grandsons home for a few days of "mini cousins camp." They are, as I write this, playing games together and then we are off to see a movie. Afterwards we will pick up two local little girl cousins and come home for an indoor picnic with hot dogs roasted in the fireplace followed by s'mores. What Better Way to Spend Christmas than Saving Babies? 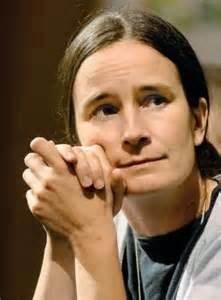 Mary Wagner is an angel sent by God to women considering abortion. Like the angel who rescued Baby Jesus from Herod's murderous soldiers, Mary goes into the temples of human sacrifice and offers women the chance to rescue their babies from Satan's knife wielding minions. Think of the life-long impact Mary has if she saves a mother from forever linking Christmas to the murder of her child. What a gift to save a mother from such a fate. This Christmas while most of us are in church dressed in our Christmas best or in our warm homes celebrating Christmas joy with our families, Mary will be in an Ontario jail. She will spend her Christmas counseling the inmates and bringing a gentle message of Christ's love. And why is she there? For going into an abortion mill with roses and a message of hope and help. Is Your Heart Ready for the King? He's coming tonight! 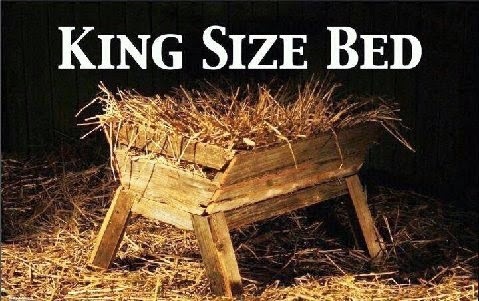 A Blessed Christmas to you and yours! I'm so happy there are young people out there fighting for the truth and "making a mess." James O'Keefe has more nerve than a cat at a hounds' convention. God bless him! Seems that standing up for Catholic orthodoxy is a no-no these days at Marquette University in Milwaukee. Well, it's a Jesuit school, after all, so who can be surprised? What's the beef? Marquette suspended a tenured professor who dared to support a student who was told by a left-wing teaching assistant/doctoral student, Cheryl Abbate, that he couldn't defend marriage in class because his position was homophobic and might offend gay students. Professor John McAdams, who defended the student's rights describes the original event between the student/teacher and the young man here. UPDATE: December 29th -- Apparently the Vatican reposted the English version. UPDATE: December 27th -- The Vatican may have removed the English video, but nothing ever disappears from the Internet. Check out my friend Janet's blog to download it and read the commentary. The Italian version is still online. Who thinks these things up? Share your "vision" in a one minute video or a photo? (Sigh.) I'm with Pat Archbold at Creative Minority Report. "Just send the meteor already." Watch the ad and then read the story about this true event when soldiers on the front lines gave up fighting to celebrate "peace on earth" for at least a few hours. An opinion piece in The Guardian called the ad dangerous and disrespectful because it "made [war] beautiful." No! It made the love between men that can take place even in the most horrific experiences beautiful. Most wars are unnecessary and senseless. But there are events in every war and people bringing about those events who rise above the evil and thrill our hearts because they are brave and beautiful. We don't love World War II because people like Oskar Schindler, Raoul Wallenberg, Msgr. Hugh O'Flaherty and Irene Sendler saved the persecuted. 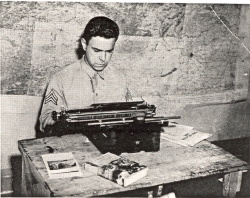 (See a list of 25 heroes of WW II who put their lives on the line.) But they shine against the darkness of the evil giving us hope. They are like lighthouses that guide storm-tossed ships to safety. I love the Sainsbury ad! It captures a moment during WW I that really happened. We should rejoice that those soldiers set aside their weapons even for a short time. It showed that man does not love killing his brothers. Shouldn't we all rejoice over that? Let us pray this Christmas especially for peace among all nations, tribes, and families. Come, O Prince of Peace. Were you among the duped? If you signed a card to Brittany, you better check. Consider that this is not all that surprising from the pro-death crowd. Women are lied to in order to get them to abort their babies. Women are lied to in order to convince them to sell their eggs for various purposes. People are lied to about the ineffectiveness of embryonic stem cell research to convince them to get behind it. You name it and the pro-death crowd are lying about it. Those who are willing to kill sure won't blink at lying. The culture of death comes straight out of hell and its CEO's resume says he was a liar and a murderer from the beginning. ....and it's a true one. The story I am about to tell is most assuredly a true one. It is a story told to me by a war veteran of the Second World War, and he assures me that this story is not an invention. This old soldier is very much in earnest, and, although it is my pen that puts these words before you now, it is his voice that spoke the words to me. And his words are true. I write the story for you exactly the way I heard him tell it—first when I was a boy, and once again, not long before he passed away. ...it always brings a smile to my face! to a cold and crude stable the night of His birth. And King Herod sought to have Him killed. And Jesus, Mary and Joseph ended up as refugees in Egypt. 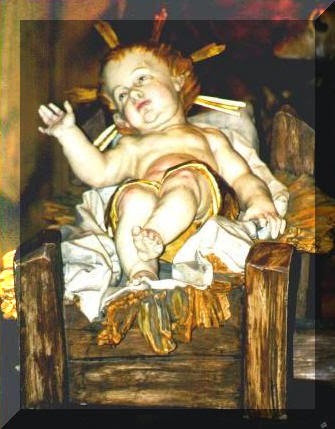 As we prepare to celebrate the Birth of the Christ Child, we should keep in mind that He reveals Himself as He really is to the pure of heart (e.g., Mary and Joseph), to the vigilant (e.g., the shepherds carefully watching over their sheep), and to those sojourning as humble pilgrims seeking the integrity and splendor of truth (e.g., the Magi). draw more souls into a sanctifying fellowship with the redemptive humility of God, revealed to us in the Christ Child. The Reason Why Democracy Works! Jeb or Hillary for President? Selling America's Royal Families! Hillary is already being presumed as the Democrat's candidate for president. And Jeb Bush is getting all lined up for a run. Hey, the royal dynasties must go on in both parties, eh. The big government lobbyists couldn't care less which of these two reign as long as they keep taxing the people to death and funneling their money to Big Lobby. But the populist grass roots Republicans do care and Jeb Bush would be a disaster. “If it turns out to be Jeb versus Hillary we would love that and either outcome would be fine,” one top Republican-leaning Wall Street lawyer told POLITICO over lunch in midtown Manhattan last week. “We could live with either one. Jeb versus Joe Biden would also be fine. It’s Rand Paul or Ted Cruz versus someone like Elizabeth Warren that would be everybody’s worst nightmare,” reported White and Haberman. Yup, there's not a penny's worth of difference between the establishment Republicans and the Democrats. They bury moral issues like abortion and walk in lockstep to increase government control over our lives. And they are burdening our children and grandchildren with crushing debt. Pray that the Lord gives us government leaders after his own loving heart instead of "kings" and "queens" who care only about building their own kingdoms on earth rather than the Kingdom of God. 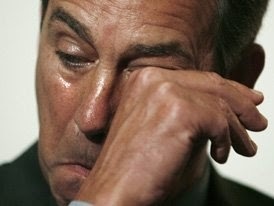 There's a move afoot to dump John Boehner as speaker of the house and I'm all for it. The man is a traitor to conservatism and little more than an Obama lackey. When my old Congressman, Jim Moran, a liberal loon if there ever was one, can say that the CROMNIBUS bill gave Democrats "virtually everything we wanted," you know that the GOP establishment has dissed the grassroots bigtime. So it's time to say a short good-bye to the RINOs and send them off. Maybe they'll join the Democrats to undo the Republican midterm win. Would it surprise anybody to see John Boehner or Mitch McConnell play turncoat? They're already sporting blue underwear (boxers or briefs?). Why Don't We See This Headline in Our Diocesan Papers? Not only that, they should receive Communion on the tongue. Maybe if we saw these kinds of articles in the diocesan papers we wouldn't have Pharisee priests denying Communion to people who kneel. I've been saying this for years. The only thing some clergy understand is money. They have more faith in the almighty dollar than in Almighty God. So it's time to strip their idol, Mammon, from the altar. The way to do that? Stop giving. If your pastor spreads the faith, then financially support the parish. If he spreads heresy and persecutes faithful Catholics forget it. For years, Larry and I have given our donations through the parish development collection because it is not assessed the diocesan tax. We don't give a nickel to the diocese. Does that mean we don't support some good things? Not necessarily. We can give to some of those things individually, e.g., by supporting the diocesan seminary directly or supporting an individual seminarian. The situation in the Church today is terrible and Jesus knew it would happen. Hey, he had a traitor among his own twelve apostles! Fr. Hardon said often that Jesus did that to prepare us for apostate bishops. And we've certainly got them along with their weak sisters. God help us. We need vigilant shepherds who protect us from the wolves. Where are they? The author of this article, Fr. Jerry Pokorsky, is a priest in my diocese and pastor of St. Michael's in Annandale. Before he entered the priesthood, Father was a Certified Public Accountant. He knows of what he speaks. As he says, nobody (especially the bishops from my point of view) talks about the injustice of imposing a crushing debt on our children and grandchildren. We are giving the next generation, not just a stone in place of bread, but a massive rockslide that is likely to bury them. There doesn't seem to be a solution in sight from a human perspective, so we all had better be on our knees praying, praying, praying. Obamacare exposed by "Rich" who paints Gruber as a "brilliant" liar. "It's really a tax on people." "This bill was written in a tortured way to make sure CBO (Congressional Budget Office) did not score the mandate as taxes. If CBO scored the mandate as taxes the bill dies." "The healthy people will pay in, the sick people will get money." "Call it the stupidity of the American people or whatever...[lack of transparency] was really critical to get it to pass." As one comment observed, "It's legislation by lies." Yup, and the Obama administration continuously illustrates that lying is its default position. The bigger lies the better and the "stupid" American people will swallow them whole like the thin cows of famine in pharaoh's dream swallowed up the fat cows of plenty. Get ready for the belt-tightening, America. Fr. Ron Jozwiak Refuses Communion to Kneeling Woman! I thought priests denying Communion to kneeling parishioners was a thing of the past. Guess I was wrong as today's VORTEX reveals. Pope Benedict only gave Jesus on the tongue to kneelers. Listen to the VORTEX to hear the story of the bully priest, Fr. Ron Jozwiak, who denied Communion to a young woman, Rachel Madi, because she knelt to receive Our Lord. 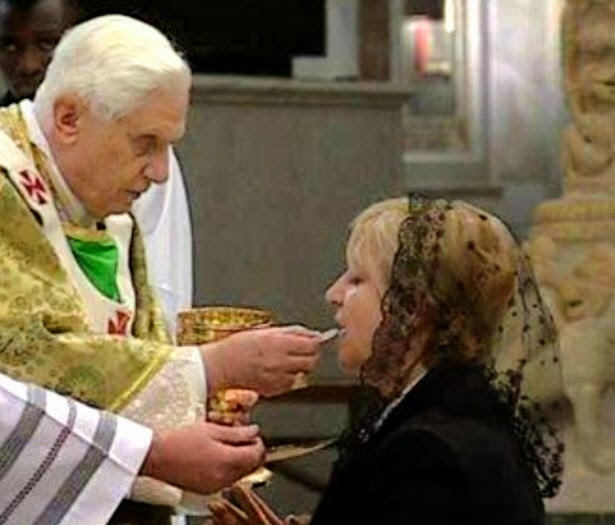 He loudly ordered her to "get up and receive Communion the Catholic way." When she replied, "This is the Catholic way," he walked around her and gave Communion to the next in line. If only she were a pro-abortion politician or a transgender in clown costurme she would have had no problem. But KNEELING AND ON THE TONGUE! Horrors. Because the priest's actions were so loud and misled the congregation into believing kneeling is not allowed, Rachel wants the bishop to instruct Prince of Peace pastor, Fr. Ron Jozwiak, to make a public apology at all Masses and to instruct the congregation that kneeling is a legitimate, canonically approved, way to receive Holy Communion. Since he's a canon lawyer he probably knows that already, but apparently he believes his opinion trumps canon law. The only thing that can rein in some of these priests is public correction. Pray for Rachel Madi and the parishioners of Prince of Peace. 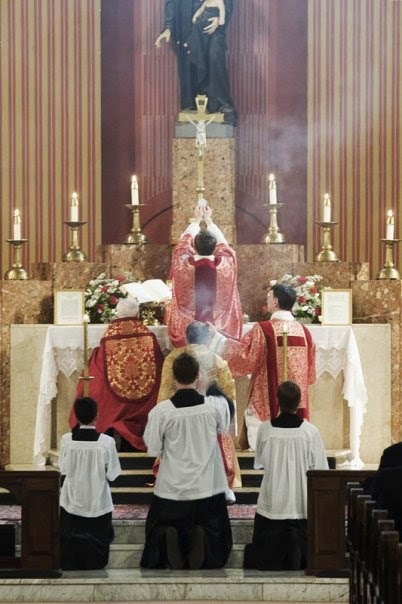 And you might consider sending a polite letter or e-mail to Archbishop Vigneron urging him to disseminate in the diocesan paper the fact that Catholics are within their rights to kneel for Communion and receive Communion on the tongue. A slap down to Fr. Ron would get the message across to other priests tempted to trampel the rights of their parishioners. I recently read a great article on sincerity by Dr. Dennis McInerny, a professor at Our Lady of Guadalupe Seminary in Lincoln, NE. [N.B. I could not find it online.] His article reminded me of another I read several years ago which began by examining the derivation of the word sincerity which comes from two Latin words, sine cera, "without wax." Odd eh? Not really. In Roman times sculptors sold all kinds of statuary for rich people's homes and gardens. The honest ones sold statues that were exactly what they appeared to be. The dishonest ones sold statues that were flawed, but they filled the flaws with wax. When the statue stood in the sun, the wax melted and all the flaws appeared. So the word sincere came to mean something that was what it appeared to be, honesty, or freedom from duplicity. "John taught his students this philosophy again and again, 'Fight all error, but do it with good humor, patience, kindness, and love. Harshness will damage your own soul and spoil the best cause.'" Who are the most difficult people in our lives? Can we treat them with the most gentleness and kindness? Can we speak of them with the most love? What a challenge! I think of how often I fail in this regard and pray for the intercession of St. John Kanty to help me do better. Lord, please give me an understanding heart. 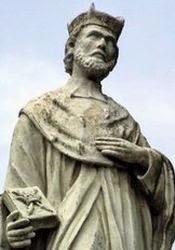 St. John Kanty, pray for us. Pray for Fr. Michael Rodriguez, Another Persecuted Priest! Blessed be the name of the Lord in both joy and sorrow. Fr. Michael Rodriguez has been persecuted for several years, primarily because of his adherence to the Latin Mass, the Mass of the ages. He is suspended from public ministry and is starting a sabbatical to discern his future. When you consider that ope;nly homosexual priests continue to serve in "good standing" the treatment of this priest is shocking...no...horrifying. Watch the humble homily from his last public Mass. and then read the linked articles below. And above all, please pray for Fr. Rodriguez and, as a sacrifice for him, accept your sufferings as a grace from God that unites you more closely to Christ. "Look to the crucifix...and understand more deeply...what it means to suffer." Amen! Wish I had a letter like this from my Congressman, but he played the traitor! One of the things the CR-OMNIBUS did was deprive the new Congress in January from having any financial impact on these issues. Instead of passing a continuing resolution that would have funded the government until the new Congress is seated in January when the Senate will be in Republican hands, Boehner, McConnell, et al removed the advantage of the election that shifted the balance of power to the conservative position. Note the sections of the letter I've highlighted. The fact is that the Republican leadership betrayed grassroots voters. No surprise! It is a well-known pattern -- which is why every Republican who voted for this should face a primary opponent in their next election. This country is in deep trouble and the guarantees in the bill for financial institutions that shift their risk to the American taxpayers. I think the bill would be more accurately labeled the "CRime-nibus bill. Read more here. I'm really ticked over passage of the $1.1 trillion monstrosity bill! Last night it came up at the Republican Women of Shenandoah County's Christmas party. We are real conservatives intent on "conserving" the Founders' principles and restoring limited government. During the course of the evening one of the ladies spoke about a meeting she attended where the Republican leadership insisted over and over at every talk and meal that Republicans MUST SUPPORT the party's nominee for any office no matter how they feel about the candidate. There was no discussion about nominees being required to support the party platform or Republican principles, however. Good luck with that one! Is the Pope Really an Expert on "Climate Change?" It used to be called global warming until the data became so inconsistent with a warming climate that they had to regroup. So now it has been rechristened "climate change," but the data still doesn't support it. What's supporting environmentalism is political correctness, money (It's all about redistributing income. ), and "green is the new red." global warming is a religion conceived to suppress human freedom....It is used to justify an enormous scope for government intervention vis-a-vis the markets and personal freedom. Amen! Maybe the pope should talk to Klaus before paying allegiance to the church of environmentalism! 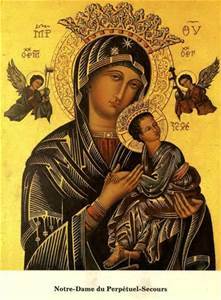 How much we need Mary's intercession! If any country needed conversion both for our own sake and the sake of the world, it's us. Why? Because we remain a Christian nation even if many are falling away. And we have the protection of the Blessed Sacrament in our many, many churches throughout our country. We must offer hope to the world through our faithful practice of the Catholic faith and our intercession for all those in need. Priests in pagan countries describe how widespread diabolic activity is. We are protected by the Real Presence of Our Sacred Lord in the tabernacle. The devil is active in the United States, but tortured souls have many aids to save them from Satan's snares. Eucharistic adoration, the use of sacramentals like holy water, blessed salt, and blessed objects also help us to resist the snares of the devil. 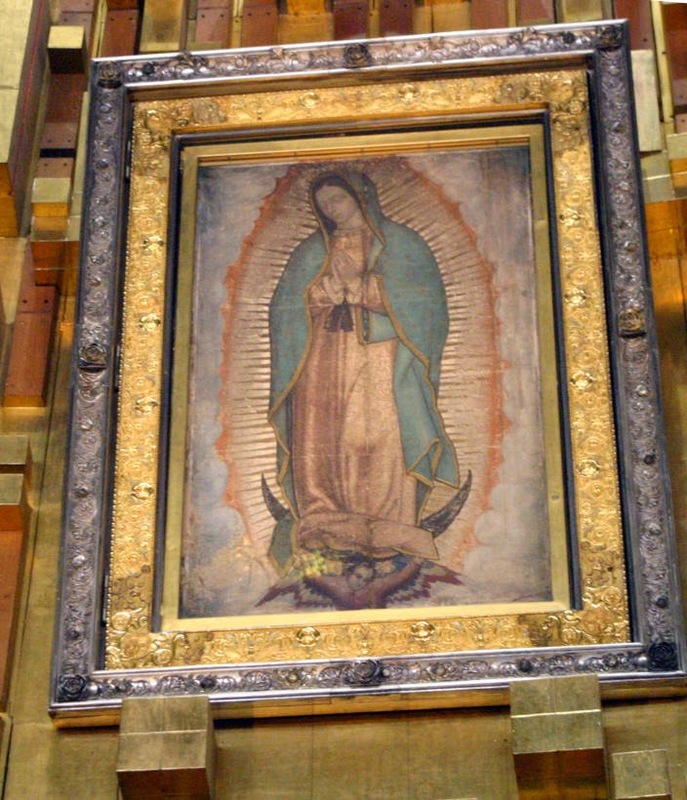 Our Lady of Guadalupe crushed the serpent god Quetzlcoatl in Mexico by her apparitions to St. Juan Diego. While the Spanish had few conversions before Mary appeared on Tepeyac Hill, afterwards millions embraced the faith. Mary, please come to us again and help your "poor banished children of Eve." Resist the devil and he will flee from you. Pray the St. Michael exorcism prayer often, especially in times of temptation. What better intercessor for the Holy Father than a pope saint. Put These Holy Women on Your Christmas List and Those Who Defend Them! The Little Sisters of the Poor are saintly women who serve the elderly treating them with grace and dignity. My mom volunteered for years at one of their homes near Baltimore. When I visited with her occasionally, I was impressed with the atmosphere of peace that pervaded the home and the cheerfulness of the residents. What a wonderful organization to support this Christmas! We are! Visit their website here. The Becket Fund is defending this wonderful order of sisters. Please visit their website and help them help these wonderful women. I'm sending them a Christmas card with a thank you note and a donation. And please pray for the conversion of our nation. Nothing illustrates the evil of the current administration like their persecution of the Little Sisters of the Poor and other religious organizations! Obama's contempt for the First Amendment is despicable and his hatred for people of faith (except Muslims) is palpable. Pray for him and his cronies. They really are the nightmare before Christmas. Do Americans Deserve this Rotten-to-the-Core Administration? Trey Gowdy doesn't think so. Liberals really do believe they are smarter than everyone else on the planet, especially those dumb conservatives who cling to their guns and their bibles. The Gruber scandal illustrates in spades exactly how these elitists think. Note that Gruber can't remember anyone taking issue with his outrageous statements when he spoke to his like-minded colleagues. He's not the only arrogant liberal in the sandbox. 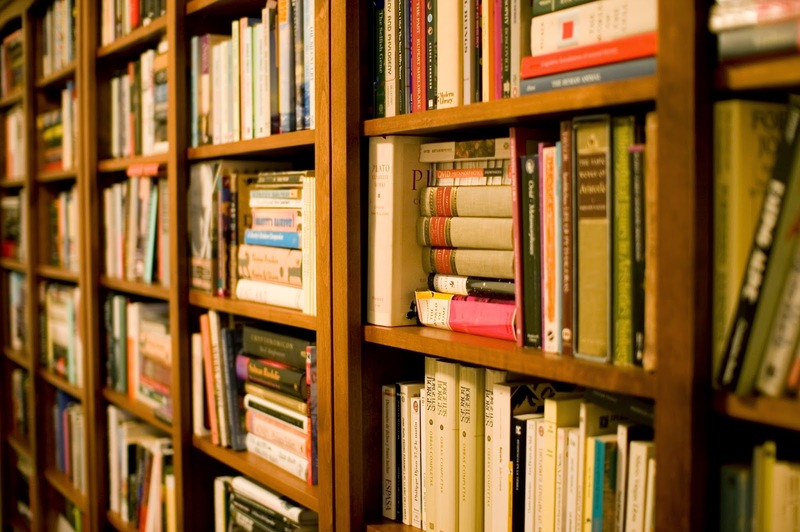 Looking for Gift Ideas for the Book Lover in Your Life? My Battle against Hitler by Dietrich von Hildebrand -- The von Hildebrand Project is offering a special -- $10 off and free shipping. The price makes it $2 cheaper than Amazon with free shipping thrown in. Can't beat that! Go here for the deal. One of the basic problems of the New Evangelization is that many Church leaders have allowed it to be trapped in a quagmire of ever-evolving expectations generated by the fads, fashions and fetishes of secular society. In trying to meet people “where they are at”, such leaders have allowed the teaching of Christ to be relativized to suit the premises and prejudices of both individuals and societies. In the process, they have de facto denied the serious need for radical repentance in order to fully participate in the saving mysteries and ministries of God’s gracious love. Instead of initiating people and societies into a whole new spiritual way of being, thinking, and acting, they have found ways to distort the meaning of acculturation so as to embrace pastoral practices that capitulate to degraded understandings of what is good, true and beautiful. Do You Participate in the Jesse Tree Tradition? It's one of my favorites. Here's how our tree looks at present. And you can read all about our "ornaments" here. Well, This is Certainly Something to Watch! Hmmm...Doth Pope Francis Protest Too Much? As for the pope's disbelief that people feel the Church seems to be like a ship without a rudder, my only response is, "I'm a 'people' and that's how I feel." But it just makes me pray all the more for Holy Mother Church and our shepherds. Good News: Louisiana Dumps Landrieu! It's a win for babies waiting to be born! One more pro-life senator and one less abortion shillmeister with the defeat of Mary Landrieu by Bill Cassidy. Two thumbs up to the voters of Louisiana! Read about the new senator, Bill Cassidy, here. 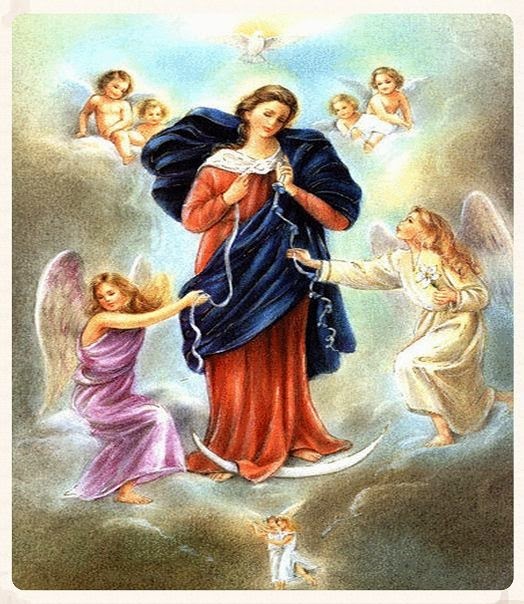 "Wear a Veil Day" on December 8th, the Feast of the Immaculate Conception, a holy day of obligation. Shall we honor our Mother by wearing a veil like she did? If anyone asks, I'll just say it's a gift for my two moms. My heavenly mother wore a long veil and my earthly mom wore a chapel veil to every Mass until the day she died. She always carried it in her purse and put it on whenever she went into a church. It brings a smile to my face to think of it. To honor you, Mom, I'll be veiled at Mass on Monday. While the U.S. bishops' conference continually mewls that illegal immigrants pouring over our border from Mexico and South and Central America are victims of violence, they are shockingly quiet on Catholics and other Christians being beheaded and driven out of their homeland in the Middle East with churches and homes being burnt to the ground and women and children slaughtered. The hypocrisy is astounding! And why is the West indifferent? There's no money and no votes from that group. They are expendable like the Jews who tried to flee Germany on ships that were turned away from U.S. harbors. Read this and be outraged, and then send a donation to Aid to the Church in Need (ACN). It's one of the few charities I trust. I believe its founder, Fr. Werenfried van Straaten, was a saint. Read about the mission and history of ACN here. And then watch this inspiring video. What a great organization for your Christmas generosity. Hat tip to Gary. Thanks for the belly laugh! Hypocrisy rules! Obama will no doubt eliminate all these in his next executive order. Ya think? The federal government, which has Tomahawk cruise missiles and Apache and Lakota helicopters, used the code name "Geronimo" in the attack that killed Osama bin Laden, all things that KILL people, officially objects to the name of the Washington Redskins. Fr. Robert Lange's memoir, Windows Into the Life of a Priest, brought to mind a literary theme called the hero's journey. Like the archetypical hero who sets off on a journey of self discovery and growth that is often painful, Fr. Lange has also walked a difficult path from youth to the priesthood and beyond, a life filled with successes and failures, joys and sufferings. 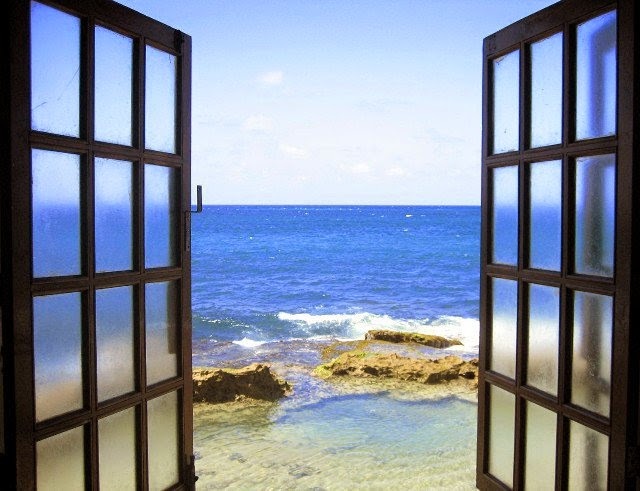 It's a journey he shares by opening wide the windows into his life. I love St. Nicholas. He was meek, loved the poor, and deprived himself of many good things to share with others. What a model for Advent. You can read about this great saint here and here. Being meek didn't keep him from defending the faith with zeal. 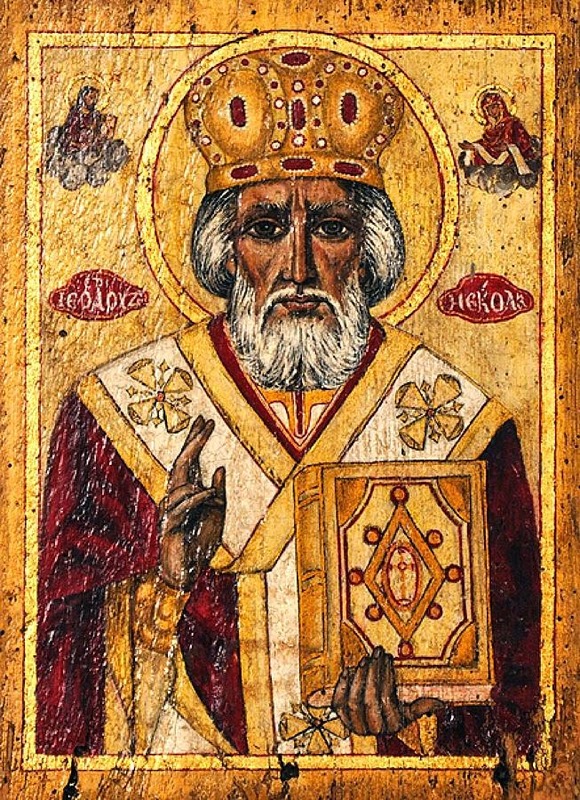 It's said that during one of the most contentious meetings during the Council of Nicea, he crossed the room and took a swing at the heretic Arius who denied that Christ was God. Gosh, we could use some bishops like that in these days of playing kissy face with dissenters and outright heretics. I'm putting my shoe out for St. Nicholas and asking him to fill it with spiritual intercessions that I might be more like him. Is this What Catholics of Chicago Can Expect in the Days Ahead? 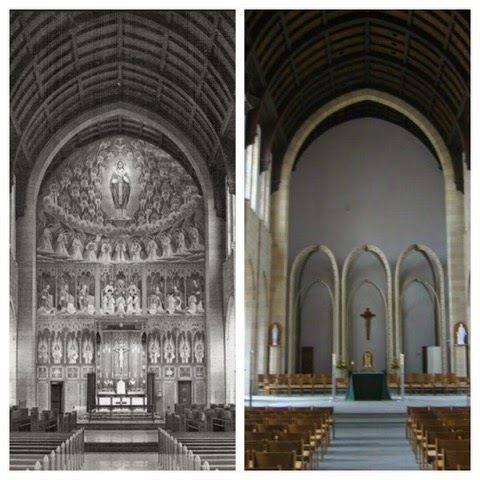 How many beautiful churches are left in Chicago after Bernardin's reign for Cupich to wreckovate? Note that not only was the beautiful sanctuary destroyed, but the pews were replaced by chairs that don't' appear to have kneelers. And what is that miserable excuse for an altar? Poor Jesus. Just looking at this makes me want to weep. Maranatha! Come, Lord Jesus, save us from these iconoclasts who talk interminably about their love for the poor while they destroy churches built with the widow's mite by poor immigrants. ...even after making the wrong choice. But act quickly! 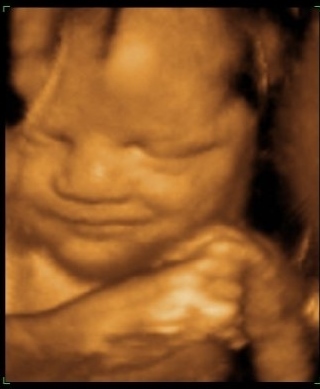 Pray that moms who immediately regret their abortion choice learn about this life-saving option for their babies. Spread this far and wide. Maybe someone you know will be saved from a lifetime of regret because you shared this information! Want to Find Out for Yourself What Happened in Ferguson? All the evidence has been released and you can read it for yourself here. This was the evidence used by the Grand Jury to determine there was insufficient evidence for an indictment of Officer Darren Wilson. Did Jesus Really Say, "Who Am I to Judge?" "Judge not, lest you be judged" (Matt 7:1). the degree of that person's culpability for the sins that distort his perspective and enslave his life. Labels: admonish the sinner, Christ's teachings, Fr. Tom Collins, Who am I to judge? So...what are you doing for Advent? 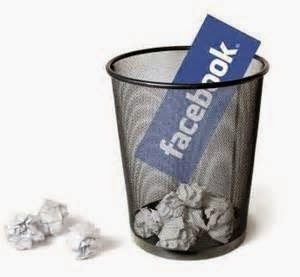 I've decided to deactivate my Facebook account until after Christmas. I find it disheartening. So often it causes squabbles and misunderstandings. There's enough of that in life from face-to-face encounters. Who needs social media that acts like fertilizer for dissension. At any rate, I want to focus on the star and its hope. So talk to me here. You won't see me on Facebook for awhile. I'm calling it Facebook abstinence.